Welcome to my stop on the blog tour for Ruby's Fire by Catherine Stine, organized by Xpresso Book Tours! I have a review for you today, and there's also a giveaway with some really cool prizes for you to enter. You can follow the rest of the tour by checking out the schedule. Seventeen-year-old Ruby, long-pledged to the much older Stiles from the Fireseed desert cult, escapes with only a change of clothes, a pouch of Oblivion Powder and her mute little brother, Thorn. Arriving at The Greening, a boarding school for orphaned teens, she can finally stop running. Or can she? The Greening is not what it seems. Students are rampaging out of control and as she cares for the secret Fireseed crop, she experiences frightening physical changes. She’s ashamed of her attraction to burly, hard-talking Blane, the resident bodyguard, and wonders why she can’t be happy with the gentler Armonk. She’s long considered her great beauty a liability, a thing she’s misused in order to survive. And how is she to stop her dependence on Oblivion to find a real beauty within, using her talent as a maker of salves, when she has nightmares of Stiles without it? 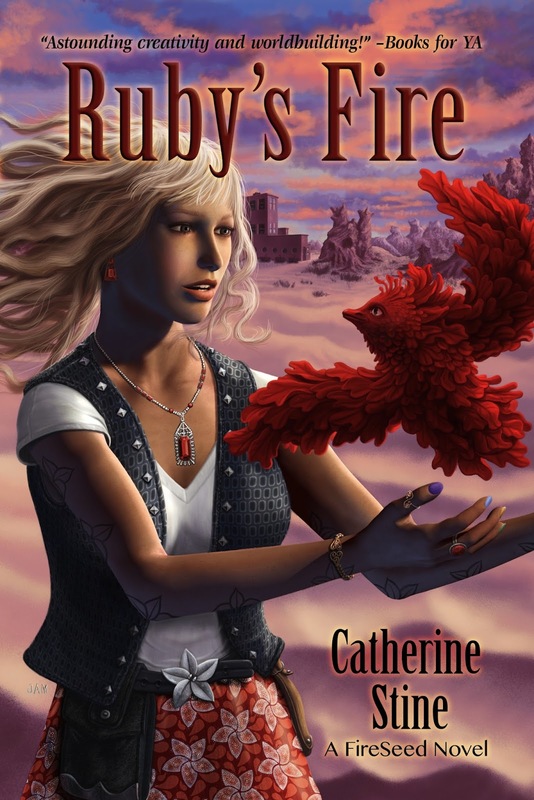 Having been quite impressed with the futuristic world Catherine Stine created in Fireseed One, I was eager to revisit it in Ruby’s Fire. Picking up ten years after the events in Fireseed One, Ruby’s Fire features new characters and a stand-alone plot, so you’re fine reading this if you haven’t read Fireseed One. Stine does an excellent job of filling newcomers to the series in on the details of the world without rehashing too much information for readers who are already familiar with it. I was looking forward to reading from the perspective of Ruby, a young woman who’s grown up in a cult that worships Fireseed, a genetically engineered plant with a multitude of uses, including as a food source. Varik Teitur, the son of the scientist who created Fireseed, had an unpleasant run-in with the cult in the previous novel, and this group and their fanaticism were really, really creepy. We learn firsthand from Ruby how insane some of these people are; she herself is on the verge of running away from them along with her younger brother, Thorn, when the novel opens. The harsh life she’s had with the cult has taken its toll on Ruby. It was hard seeing her believe that using her feminine wiles was the only way to get what she wanted because that’s what had worked for her when she was with the cult. She’s also a drug addict, dependent on her homemade Oblivion Powder to make her forget her nightmares. The world outside of the cult is alien to her, and her adjustment to life at The Greening, a school that takes her and Thorn in, is bumpy at the start. I didn’t always like how Ruby acted, but I had to cut her some slack and keep reminding myself of how negatively the cult had shaped her life. She does grow a lot throughout the book, too, which helped me form a better opinion of her by the end of it. Armonk, one of the students at The Greening, had a small but memorable appearance in Fireseed One, and I was thrilled to see him here. Unlike the others, he doesn’t judge Ruby because of where she came from, and he’s a steadfast friend to her. It took me a while to warm up to some of Ruby and Armonk’s other classmates, like Blane and Bea, but they, like Ruby, demonstrated significant character growth as the novel went on, Blane in particular. Normally, reading about plants does not interest me at all, but Fireseed is a very special case. Its origin is fascinating, and Stine writes about it in a manner that treats it more like a character than a mere plant. I really liked the Fireseed contest story line, in which students from different schools, including The Greening, competed to find new applications for Fireseed. I found myself intrigued by the students’ projects and discoveries, and it was Blane’s brilliant presentation at the event that really changed my perception of him. 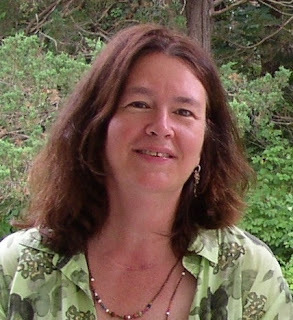 As she did with Fireseed One, Catherine Stine has once again written a compelling story set in a highly imaginative world. Ruby’s Fire is a great complement to Fireseed One, but even if you haven’t read the latter, this is an absorbing novel all on its own. This world is so different from others I’ve read about, and it gives the book a unique feel to it. There’s also a nice continuity between this and Fireseed One, but again, you’re very much okay, too, should you decide to only read Ruby’s Fire. I like Fireseed One, but enjoyed Ruby's Fire more and I like that it provides continuity and yet can be read as a standalone novel. Super review, Lee. I really liked that aspect of Ruby's Fire, too. It was an independent story, yet there were plenty of nods to Fireseed One for those who've read it. Sounds very unique! Glad you enjoyed it, Lee! It's such a fascinating world, and so are the characters! You nailed it! Plus, thanks for hosting. Happy to be a part of the tour! I really enjoyed both books! I like the fact that this is a stand alone as well as a series. Ruby sounds like a very interesting heroine. Look forward to reading the book. She is! I hope you enjoy reading this! This sounds like a very interesting and intelligent fantasy story and world-building! I really enjoyed reading your review! The world-building is awesome, and the world itself is refreshingly unique. Not familiar with the series but the fantasy element sounds really good. I've never read a book about magical plants but I can understand why it can be interesting. The Fireseed plants are incredible. They could probably even withstand my non-existent green thumb, lol. I love sci-fi because its futuristic and something to look forward to. Definitely. I think it'd be interesting for future generations to look back on sci-fi titles from our present and see how much of those books' visions of the future became reality. These magical plants can do scary amazing things! I love when a book in the series can be red as a part of the series, or on it's own. That's what I love about the Giver series, and it makes me interested in this series! I really need to read The Giver; I've heard so many fantastic things about it. I'm really intrigued by what you said about the plant being like a character. New, unique, imaginative worlds are a gem in any book so I'm glad you found it with this one. Excellent review! Jaclyn @ JC's Book Haven. The Fireseed plants were so interesting to read about; they were truly as important to the book as the human characters were! Wow this series just sounds brilliant! I think I'd still want to read book 1 first, especially since I know you enjoyed both of these but I love that book 2 can work as a standalone nonetheless! The creativeness of this world just sounds too fresh to pass up :) Glad you enjoyed this one Lee! I'm really glad that I read Fireseed One first; it definitely enhanced my reading experience with Ruby's Fire.